With the help of Ofgem's handy pie chart, let's take a look at what you pay for. Before we go on, note that this is a TYPICAL breakdown for a DUAL FUEL customer. Some of the "wedges" will vary depending on supplier, which part of the country you're in, and how much energy you use. Let's examine each wedge in turn. As you can see, the largest wedge by far (almost half) is the wholesale cost of energy. This is the price at which suppliers, like us, buy the energy from the generators. Some suppliers generate their own energy, but aren't allowed to supply themselves directly. Instead, they sell to the National Grid and buy back what they need. We've covered what drives wholesale energy prices in a separate blog, but a lot of it rests on supply and demand, and events that affect generation, transport, or storage. Nowadays, for example, much of our gas comes from overseas, including Norway and Russia. Events which affect these countries, or any of the countries upon which they rely for the distribution or generation of energy, might affect the wholesale cost in the UK. These are all the costs associated with getting the electricity and gas from the generators and into homes and businesses across the country. All the infrastructure, transport, and maintenance costs – pylons, wires, pipes, tanks, substations, meters, balancing, storage, and the cost of supplying energy to difficult areas like remote or awkward terrain. It also pays for running 24 hour emergency telephone lines in the event of outages. Some of these costs, specifically those involved in the distribution of energy, are limited by Ofgem. This helps to keep the prices fair for customers. The energy industry is the largest contributor of greenhouse gas (GHG) emissions in the UK – 31% of 2014's GHG emissions were from energy. It's therefore vital suppliers reduce their output of GHGs and invest in renewable energy generation. The Renewables Obligation (Ofgem) sets out this responsibility in legal terms, and ensures that all electricity suppliers do their bit for the planet by subsidising and investing in renewables. The Feed-in Tariff works on the same basis for domestic solar panels, requiring energy suppliers to pay customers for their solar electricity generation. Also, given that everyone has a right to a warm home, energy suppliers must help those who can't help themselves. This includes the Warm Home Discount, winter fuel payments, and the Energy Company Obligation (which provides insulation, replacement boilers, and other energy-efficient measures for those in need). These are a variety of smaller expenses including commissions paid to brokers selling energy on a supplier's behalf, balancing companies like ELEXON, and trading platforms like XOSERVE. When we estimate future electricity needs, we don't always get it completely right. We might underestimate or overestimate how much we need, and ELEXON help make up the difference and then charge it back to the supplier. XOSERVE has a record of all the gas supply points in the UK – a staggering 22 million. They help the gas shippers, those who sell gas to suppliers buying it on behalf of their customers, to move the gas into the various homes and businesses that need it. This is the area that energy suppliers have the most control over, and where you'll likely see most difference from one supplier to the next. 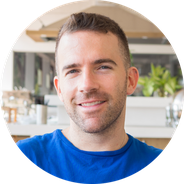 For the larger, more established suppliers, these costs are large – covering staff, offices, call centres, meter or engineer visits, bad debt, billing, IT, sales, and marketing. Our operating costs are a lot lower than most other suppliers. We're a digital company, using the advantages of 21st century technology to make buying energy easy and convenient. We don't have huge call centres, we give our customers greater control, and we design most of our own technology. We then pass on these efficiency savings to you, the customer. This is the difference between your payments to the supplier, and that supplier's cost to deliver the energy to you. This doesn't mean profit, since tax payments and other costs have to come out of this wedge, but profit will be an element of it. Currently, VAT on domestic energy is 5%. So there you go. 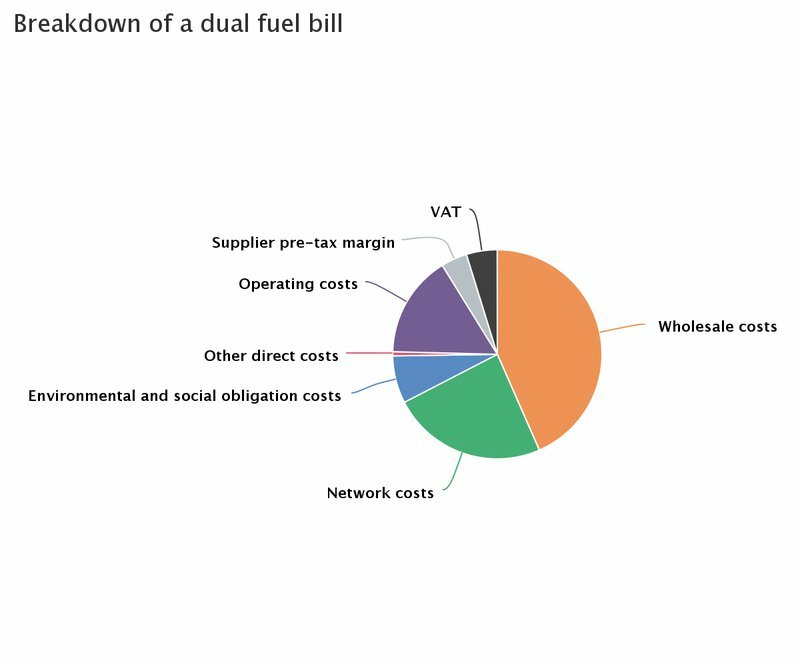 A simple breakdown of what makes up a typical dual fuel bill.